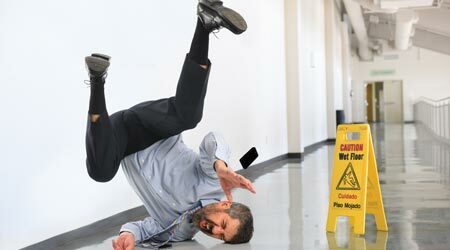 Slick floors can be a slippery slope for building service contractors. In retail stores, office buildings, schools and restaurants, slick floors can lead to slip-and-fall injuries, and janitorial workers are often held accountable. Without adequate floor cleaning protocols, training and documentation, contract cleaners could find their reputation at stake — and their business the target of a lawsuit. Some BSCs hire a third-party walkway traction auditor to test the floor’s coefficient of friction — the ratio of the force needed to move one surface horizontally over another and the pressure between the two surfaces. This measurement can be used to express the degree of slip resistance of a floor surface. Alternatively, BSCs can test the floor themselves using a tribometer, an instrument that measures the coefficient of friction between two surfaces. The NFSI offers training courses — including a class called Tribometery 101 — that teach BSCs how to use various testing devices, says Kendzior. Testing floors before and after cleaning can help BSCs identify issues and determine whether or not their services are a contributing factor to slick floors. According to Brent Johnson, chief auditor for Traction Auditing in Southlake, the biggest problem is not the cleaning products, but the floor itself. More often than not the answer is no. First and foremost, BSCs should educate themselves about the type of floor they’re cleaning. For instance, is it regular vinyl tile that requires floor finish? Or is it a newer resilient flooring tile with a urethane coating that does not require finish? BSCs also need to educate staff so that they use the right products on the right floors. Johnson recommends facilities use products tested and certified “high traction” by the NFSI. These products maintain walkways in the high-traction range of ANSI/NFSI B101.1 national standard requirements. In addition to using third-party certified products, consultants emphasize the importance of proper dilution ratios. BSCs should also exercise caution any time they purchasing floor chemicals that contain fragrance, says Steve Spencer, a consultant and former facility specialist for State Farm Insurance, Bloomington, Indiana.